If the newspapers could be believed, 1908 Santa Rosans faced great risk of being run over by a thirty horsepower car being driven at the breakneck speed of 25 MPH. Although there were several arrests for speeding the previous year, the problem became endemic as more people bought automobiles. "There are several auto drivers in the city who are running their machines very near the danger line," commented the Santa Rosa Republican. "Sooner or later, if the brakes are not put on, there will be trouble... city authorities are determined that the crowded streets shall not be made speed tracks by speed-mad auto drivers." The speed limit that year was 10 MPH, up from 6 MPH in 1904, then raised to 8 MPH the year after. A quick search of 1908 Bay Area newspapers shows that city speed limits varied between about 10-20 MPH. Oakland had a limit of ten miles per hour for the business district, and 18 MPH in residential areas. In the cross-country races between Oakland and San Francisco via San Jose, drivers were expected to stay below 20 MPH. Part of the problem was that it was still the age of horses and bicycles, and few could accurately judge how fast a car was moving - and that included some drivers; speedometers, sometimes called "speed-markers," were not yet standard equipment on all vehicles. So the Republican newspaper offered a helpful article comparing speeds of bikes and wagons and cars, pointing out that a bicyclist on a smooth road could easily reach 15 MPH. 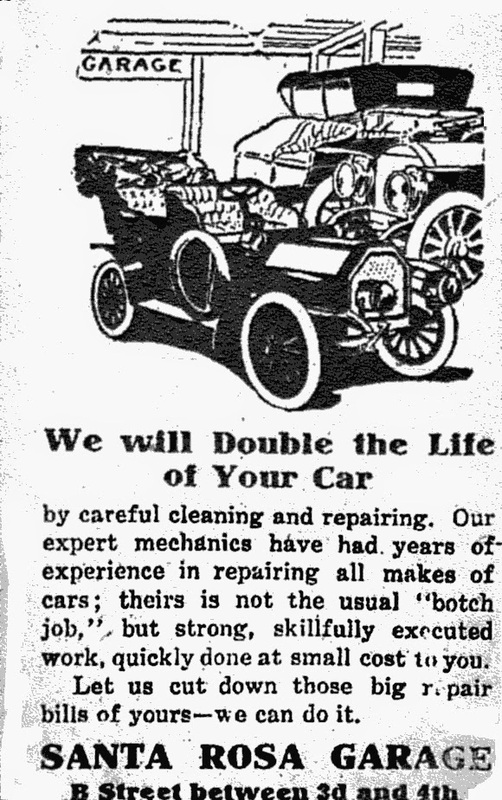 That article concluded with a sympathetic nod to the motorists, noting that "few of the large automobiles can get down to 5 or 8 miles without 'killing' the engines, the machinery being constructed for higher speed." Still, "there is no doubt that many autoists here get 'speed mad' and drive their cars at a dangerous clip. Some regulation is doubtless needed." The speed limit was set to 10 MPH with a maximum fine of $50. The same article reported George W. Davis had to do some "lively moving to get out of harm's way" of one driver. "The young man at the throttle condescended to blow the horn, but there was never any shutting off of power to prevent an accident. The speed burners seem to think that if they give a man warning they are coming they have done their whole duty. It is then up to the individual to get on the way or be maimed, according to the way of thinking." Arthur W. Parent, a young man of Petaluma, who is said to be a reckless auto driver, was arrested by Police Officer Boyes Monday afternoon for making a speedway out of Fourth Street at a time when there were many women and children and vehicles on the street. When Parent dashed up the street people stood aghast, expecting to see an accident. Police Officer Boyes caught the number of the car and send his bike along at a lively pace. Parent stopped at the local establishment and then Officer Boyes took him over to the police station, where he put up $15 for bail. It's not likely that he will appear for trial for there are too many witnesses as to his speed to make it worth the while. He gave his name to the office when arrested. According to statements made here Monday afternoon it seems that this young man runs his machine regardless, and has come nearly getting into trouble in Petaluma. The arrest on Monday afternoon should be a warning to several young chauffeurs here who have been doing a little scorching themselves. With the idea of getting some correct information on "speeds" of different classes of vehicles in the city, a Republican reporter this morning paced an automobile, then an electric car and finally himself. 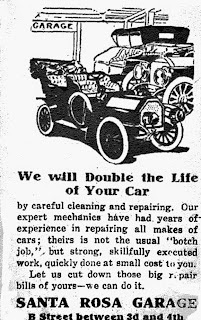 The auto belongs to Mr. H. H. Bowers of Sebastopol Avenue, a fine machine of about thirty horse power capacity and about a 40 mile speed limit. With Chief of Police Rushmore and Officer John M. Boyes aboard to see that the newspaperman did not get mobbed or smashed up, the "pacers" started. At the rate of ten miles an hour by the speed indicator the auto was 33 seconds going along Fourth Street from B to A, or a distance of about 490 feet. This is one of the longest blocks in the city. Ten miles an hour spells 880 feet a minute--14 2/3 feet a second, so with this second base, the mathematical timer can follow it out to an infinitesimal figure. On the upper part of Fourth Street the party paced an electric car and the little speed -marker on the auto caught the big machine going 17 miles an hour. The speed was lower, however on the business portion of the street. To get a more practical idea of what 10 miles an hour looked like, the reporter on a bicycle paced the auto, or rather, let the big 40 horse power machine pace him. He learned that quite a slow speed on the bike will be about 5 miles and the ordinary work on the pedals will reach the 10 mile rate. On the smooth pavement of the bicycle rider, at 15 miles, could easily keep in touch with the gas burner, but at 20 miles it left him behind pumping his "durndest." Ten miles an hour is not a rapid speed and a passenger can safely jump from the auto at that rate, while 5 miles is slow. A man can walk 4 miles an hour and a buggy or light vehicle will ordinarily travel 12 to 15 miles in that time. Few of the large automobiles can get down to 5 or 8 miles without "killing" the engines, the machinery being constructed for higher speed. On the whole it seems that the auto speed limit proposed to the City Council Tuesday evening is somewhat low. However, there is no doubt that many autoists here get "speed mad" and drive their cars at a dangerous clip. Some regulation is doubtless needed. At the meeting of the City Council last night Chairman Johnston of the Ordinance Committee, introduced an ordinance making it a misdemeanor for drivers of any automobile, motor car, etc. to drive faster than 10 miles an hour within the city limits of Santa Rosa. Violation of the ordinance is made punishable by fine not to exceed $50. In lieu of payment of which find to be jailed at the rate of one day for each two dollars. In the regular course of the ordinance it was referred back to the Ordinance Committee to report again at the next meeting. Dr. J. H. McLeod addressed the Council and stated that a physician in cases of emergency would exceed the ten-mile limit, and he thought in cases of life or death the arrest and fining of the physician violating the law should not follow. The doctor spoke from experience, and said the flyer he had to put up was a clear loss as the case he attended was a charity case. City Attorney Ware opined that one law must govern all. There are several auto drivers in the city who are running their machines very near the danger line and some day the public will be interrogating in a fierce "why?" It is becoming the usual thing to see a great 30 horsepower car plunging down a city street at a speed prohibited by state, county and municipal laws, and sooner or later, if the brakes are not put on, there will be trouble. Late Sunday afternoon when the streets were thronged with pedestrians out to enjoy the cool evening, after the blistering day, a big touring car appeared on Mendocino Avenue going north. Five or six young men where the occupants and they were enjoying themselves to the limit. As they passed the residence of Chief of Police Fred Rushmore the machine was not at its greatest speed, but the officer called out a warning. Near Cherry the car had attained a speed of 35 or 40 miles an hour. As the great vehicle rushed roaringly passed it made as much noise and tore up as much dust as a railroad train. At College avenue a carriage containing several ladies hurriedly pulled to one side and the auto slowed down slightly to prevent a smashup. These young man--all well-known-- had been on an all day ride in the country, but had concluded to return to town and take in the streets. The shaded thoroughfares are more comfortable, possibly. The speed limit was set by the city council June 17, the ordinance went into effect on the 18th. Any auto driver moving more than 10 miles an hour within the city limits may be arrested and fined for the offense $50. Signs will be placed at different points in the city lines for the information of strangers, but the local chauffeurs need no such warning. "The city authorities are determined that the crowded streets shall not be made speed tracks by speed-mad auto drivers. In the country they may have at out with the supervisors, but in town they must consider slower vehicles and pedestrians." This is the statement of a city official and it means everybody. Ten miles is not a rapid rate and the automobile people complained that it "kills" the engine of the big 40 horsepower machines to slow down to that speed, but this theory will have to be concreted into a fact and moreover law is law. While a speed of 12 work or 15 miles may slip by the observant policeman, 30 and 35 "won't go," the cop says. The local officers intend to strictly enforce the city ordinances providing for a speed not exceeding 10 miles per hour in the city limits. Some men have been arrested recently for violating the ordinance, and persons on the streets assert that these men were traveling at a rate exceeding 20 miles an hour. One enthusiastic automobilist who is experienced in these matters, asserts that a machine driven by a local man came whizzing around a corner Thursday evening traveling at a rate of 25 miles an hour. Recklessness on the part of chaffeurs and automobile owners brings the sport of running machines into disrepute and brings forth the displeasure of the people on the heads of all who run autos. This is not as it should be. There are many careful and conscientious drivers, as compared with the reckless ones, but all are judged hastily with those who break the laws. George W. Davis came near being run down Friday by a youth who came through town too lively for the speed limit and the safety of pedestrians. It required lively moving to get out of harm's way. The young man at the throttle condescended to blow the horn, but there was never any shutting off of power to prevent an accident. The speed burners seem to think that if they give a man warning they are coming they have done their whole duty. It is then up to the individual to get on the way or be maimed, according to the way of thinking. Officer Lindley has recently come in for a lot of abuse for arresting automobilists who violate the speed ordinance and this should not be so. An officer should be upheld by all the people for doing his duty, and be made to feel that the people appreciate his efforts to enforce the law. Officer John M. Boyes taught an offending auto driver a valuable lesson on Monday, when the man passed through this city at a rate of speed estimated to be about 50 miles an hour. The man was arrested at Petaluma by Constable Jimmy Sullivan on the request of Officer Boyes, who was fortunate enough to have learned the number of the auto driven by the offender. The car was numbered 12570 and the name of the man arrested with the car by Constable Sullivan was given as McDonald, a San Franciscan. The man called up Officer Boyes after being taken into custody in the southern city and try to "square" the case with the officer, but the latter is not the kind of man that can be "squared" with, and he promptly told the offender that the only way he could secure his release would be to put bail for his appearance here when wanted. Those who saw the speed developed by the driver passing through the city were wrathy, and the good work of the officer is being committed not only by the public in general, but by automobilists in particular. These men want the laws enforced and will give their aid to the officers whenever they can to prevent infractions of the speed limit.